Liam O'Meara launched his long-awaited history of Richmond Barracks - "From Richmond Barracks to Keogh Square" - in the all that remains of this historic building, the Barracks gymnasium (where Liz Gillis' book launch was held - see above) on Thursday December 4th, 2014. The book was formally launched by Martin Mansergh before a huge crowd, which snapped up the copies on sale at the special launch price of €25 (hardback) and €15 (paperback). This book is a magnificent work of over 10 years' research and includes more than 100 rare photos of the Barracks and Keogh Square. 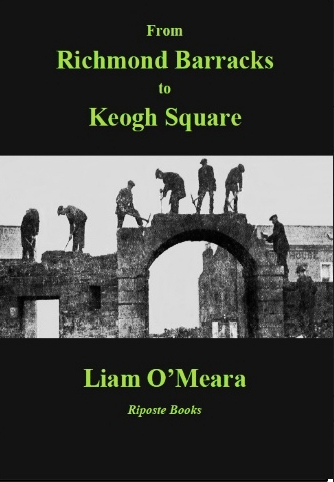 "From Richmond Barracks to Keogh Square" is a tribute to author Liam O'Meara's dedication and research, and is essential reading for anyone who lived in Keogh Square, or who is interested in any aspect og the Barracks' history, including its role in the aftermath of the Easter Rising.